Building sustainable advantage means gaining a favorable, superior, and beneficial position for an enterprise that will continue over time, either by developing, enhancing, or maintaining the current state, or by changing it. It is an ongoing process from the creation of a vision to the delivery of value. The Framework for Building Sustainable Advantage is a fundamental tool for establishing the mindset and actions required to transform vision into value on an ongoing basis within an environment of change - either by causing it or responding to it. "Sustainable" means the ability to continue on an ongoing basis; "advantage" means being better off now or in the future relative to the past, or to other entities. Being advantaged applies both to individuals in their communities, and to enterprises in their marketplaces. Employees, customers, suppliers, and investors participate with an enterprise as primary constituencies because they contribute to the value-creation process. Regulators and competitors participate as secondary constituencies. 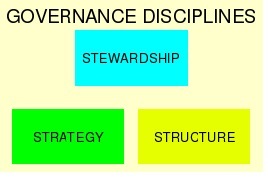 Governance disciplines are the attitudes and behaviors required to build sustainable advantage for a vision, including taking responsibility for an enterprise, positioning it, and enabling the necessary relationships that deliver value. Stewardship - the responsibility for the performance of an enterprise and the delivery of value to constituencies. Stewardship competencies have three components: enabling, domain, and core. Enabling competencies depend upon the effectiveness of entrepreneurial, leadership, and managerial roles. Domain competencies represent the specific functional knowledge and technical skills required to perform an activity. Core competencies represent activities well done that give the enterprise an advantage. Strategy - the beneficial positioning of an enterprise in marketplaces so as to deliver value over time. Strategic plans are long-term statements of direction - typically three-to-five years or more, with short-term initiatives as necessary from the point of departure to one-to-three years out. Strategic plans decompose into enterprise aspiration and industry position and posture, competitive position and posture, performance improvement, constituency-based, functional, and governance components. Structure - the enabler of relationships between an enterprise's infrastructure, products and/or services, markets, and constituencies that deliver value. An enterprise's infrastructure includes processes, functions, facilities, and equipment. Capabilities represent the capacity and ability of people, processes, and products and/or services to realize potential quality and value. Capacity is a measure of utilization of resources. 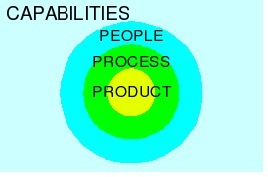 Ability determines expected quality of performance for activities; potential suggests possible outcomes of activities. People - the constituents of an enterprise: employees who devote careers, customers who are loyal, suppliers who advance credit and quality materials and supplies, and investors who source capital. Processes - the arteries of an enterprise. Every enterprise has a set of processes - groups of activities that take one or more kinds of inputs from which value is delivered to either internal or external customers, or both. The outputs are either end-products or components that are assembled into end-products in downstream processes within the enterprise or in its customers. 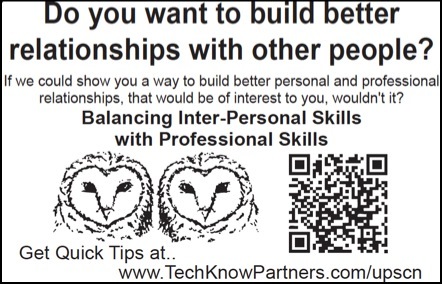 Processes are the intersection of people and products and/or services. Macro processes cross functions and decompose into micro processes within functions. The highest level macro processes are planning and policy development, deployment, and performance measurement. 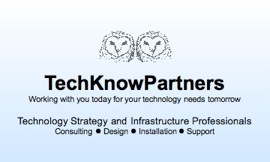 The deployment process subdivides into research and development, and sales and production. Products and/or services - outputs from processes that are of value. The term "product" is associated with something that is tangible; the term "service" is associated with something intangible - capabilities delivered at the time of sale or shortly thereafter, and/or in support downstream. The term "products and/or services" describes collectively all types of products and services, including "service-oriented" products that are definable, duplicable, and repeatable. Capabilities are delivered through functions. Functions are groups of knowledge-related (subject area) activities that have a purpose. Functions house people who deliver value through processes. Functions form the first level of organizational structure within an enterprise. Every enterprise has three macro functions: governance, administrative, and operational. The governance function (the board of directors and the chief executive officer of a corporation, the members of a limited liability company, the partners in a partnership, or a sole proprietor) has the ultimate responsibility for the performance of the enterprise to its investors. The administrative functions include: enterprise, legal, finance, human resources, and information technology; the operational functions include research and development, operations, and business development. Operations subdivides into procurement, manufacturing (or equivalent), and distribution; business development subdivides into marketing, sales, and service. The enterprise function provides support activities for planning and policy development, and performance measurement; brand management; facilities management; community, employee, investor, and government relations; and internal audit. The research and development function is "cross-functional" and heavily project-oriented. It represents a set of processes for program management and engineering, and market, product and/or service, and infrastructure-related activities. 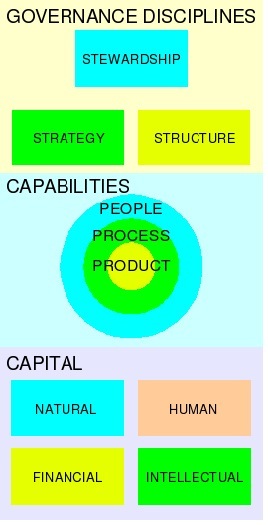 A functional organizational structure is suitable for entrepreneurial and small lifestyle enterprises. As an enterprise grows into multiple markets and product and/or service lines, more complex matrix organizational structures are necessary with business line, geographic, and demographic characteristics. Business lines separate activities such as merchandising, manufacturing (or equivalent), and financial, and enable concepts such as centers of excellence and utilities that support multiple organizational units. Organizational units may be decomposed into divisions, departments, branches, and plants, and also into reporting, responsibility, profit and cost centers. Building sustainable advantage from vision to value requires optimizing the capabilities of people, processes, and products and/or services. Enterprises are built on a foundation of natural, human, intellectual, and financial capital, which must be managed effectively and efficiently. Understanding the costs, risks, returns, and rewards associated with each form is essential to building sustainable advantage. Invested capital is employed for both operating and investment purposes. Equity capital represents ownership in an enterprise, and consists of the enterprise's assets less its liabilities. Assets represent opportunities - what is owned by the enterprise, and what is owed to it. Liabilities represent obligations - what is owed by the enterprise. In free markets, production and distribution activities are intended for profit, and the prices that determine gross revenue are ultimately set by supply and demand. Net income results from operating profit - gross revenues (dividends from other enterprises, net interest, sales, rents, and royalties) less costs and expenses, net gains on sales of capital assets, less income taxes where applicable. Net interest revenue comprises gross interest revenue less interest expense. Cash flow represents differences between cash provided and used in operating, financing, and investing activities. On an accrual basis, net income is adjusted by non-cash charges and credits to determine cash flow. The return on financial capital creates wealth, which is a source of future capital. There are many measures of return on financial capital based upon earned income before and after interest, taxes, depreciation, and amortization, and based upon invested capital with or without the inclusion of cash and investment assets. Whatever the measure, for an enterprise to be sustainable, the cycle of generating a return on financial capital must repeat indefinitely. In turn, wealth enables investments in natural, human, and intellectual capital. Building sustainable advantage is a migration path from an entrepreneurial enterprise as a venture to an intrapreneurial institutional enterprise. Whereas entrepreneurs organize, operate, and assume risk for an enterprise, intrapreneurs foster a culture of change within so as to keep it sustainable over time. An entrepreneurial enterprise is not yet fully established as an ongoing concern, may have to rely upon external capital as opposed to bootstrapping to finance future growth, and is either in the emerging or growth stages of development (or decline stage, if it cannot institutionalize). An institutional enterprise is established (stable with predictable constituency patterns emerging); is becoming, is, or was an ongoing concern; and is in the growth or maturity stages of development (or decline stage, if it cannot remain as an ongoing concern). The stewards of an enterprise include management (the governance function, officers, and non-official managers) and associates (supervisors and staff). Every employee is a steward if they share the values, mission, and vision of the enterprise. Stewards administer the affairs of the enterprise, and protect its assets. The stewards of an enterprise must be able to enact change, either by causing it or responding to it, which in turn generates change, and hence adapt to the changed environment accordingly.